Bryan Castle (center) leads a project to add several Accountable Care Units throughout Emory Healthcare. Castle codeveloped the ACU model with hospitalist Jason Stein. The nursing school’s Susan Shapiro helped secure funding to expand the ACU model. Good morning, Mr. Blake. We’re back again for team rounds. I’m Jason Stein, your doctor, and you know your nurse today, Diaz. Also here with us is Jennifer from Social Services and Melissa, your pharmacist. As we’ve discussed, you have high blood pressure and diabetes and were admitted to the hospital because your kidneys were injured. We’ve been trying to understand why, and there are signs that your kidneys may be recovering. Your nausea is still troubling you, and we’re going to focus on that today. Is there anything else you would like to add? As the discussion unfolds, the interdisciplinary team learns that Mr. Blake and his family are concerned about his discomfort and his medications. The team works with them to form a care plan that includes adjusting his medications and changing out his catheter to make him more comfortable. Welcome to the Accountable Care Unit (ACU), a model of collaborative practice growing in use throughout Emory Healthcare. Before the ACU was launched on 6G in 2010, nurses and doctors worked independently of each other, and physicians, on average, covered patients on eight different units. 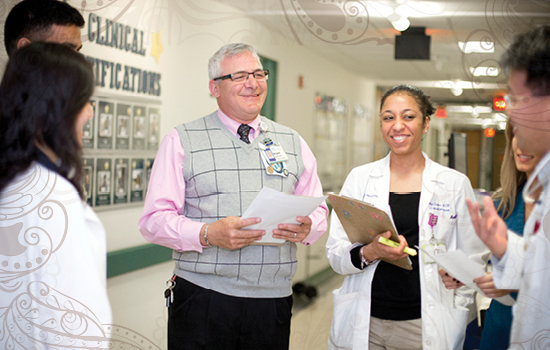 With the ACU, physicians—just like nursing staff—are dedicated to a primary unit that is jointly managed by a nurse and physician. Team members share responsibility for all clinical, service, and cost outcomes. Trainees from different disciplines also play a role in the unit. Emory Healthcare now has five ACUs—three at Emory University Hospital, one at Emory University Hospital Midtown, and one at Emory Johns Creek Hospital. Seven more ACUs are scheduled to open during the next three years, funded by a $1.5 million cooperative award from the Health Resources and Services Administration to the School of Nursing and Emory Healthcare. Expansion will occur in two phases, with three ACUs in the first year and four more in years two and three. A key objective of the award is to train more staff nurses to lead interdisciplinary unit-based teams. Training is now under way at Emory University Hospital Midtown for nurses, hospital and community physicians, and ancillary service providers. The cooperative agreement also provides for further evaluation of ACU effectiveness and development of a tool kit that other health care systems can use to establish ACUs. Award principal investigator Susan Shapiro PhD RN FAAN, who bridges clinical nursing education and practice through joint appointments in the School of Nursing and Emory Healthcare, became an early proponent of the ACU after Bryan Castle MBA RN and Jason Stein 98M, the Emory Healthcare clinicians who developed the ACU, invited her to join them on rounds. "What impressed me most was how the interdisciplinary team engaged patients in their care," says Shapiro. "The ACU is all about relationships. It’s about the relationship between the physician and nurse leader and the rest of the team. And it’s about their relationship with the patient and the way they handle their performance measures each month. They’re focused on those outcomes as indicators of how well they’re doing with their patients." Castle, formerly the nurse manager on 6G, and Stein, a hospitalist, developed the ACU as part of an Emory Healthcare initiative to transform care delivery and leadership. They sought to move away from the physician-centric model of care to one that engages team members and patients in all aspects of daily care and discharge planning. The ACU does so by encouraging team members and patients and families to talk to one another, a process called collaborative cross-checking. Team members use their first names, share in communicating and advancing the daily care plan for each patient, follow a well-scripted quality and safety checklist (a step that has reduced infection rates), give constructive feedback, and monitor individual and team performance. Getting to the ACU’s 2010 launch date took eight months of discussion and planning, and Castle was among those who pushed to hold rounds inside rather than outside of the patient’s room. "There were a lot of different ideas about how the unit should look and feel to come to a shared mental model of what we’re doing," he says. "We did some falling down in the process and a lot of debriefing about what did and didn’t work. We would then test the changes and make some refinements. We quickly learned that we needed a "rounds manager" and who better than a nurse? The nurse coordinates and manages the team during their rounds." Emory Healthcare physicians and nurses who work on ACUs give the model high marks. "Employee engagement has been the highest I have seen," adds Castle, now project director for the ACU award. "It’s the first time in surveys that I’ve seen that 100% of nurses felt like they had a collegial relationship with the physicians who they work with on the unit." "We have real work relationships now," adds Stein. "Everyone knows everyone and something about each other. We’ve had a lot of people observe our unit, and they often remark how quiet it is. Phones and pagers are used less—there’s much more face-to-face communication. There’s a certain calm and order." Has the ACU proven beneficial for patients and families? In an online article for Harvard Business Review in 2013, Stein, Castle, Shapiro, and colleagues report that during the first year of the ACU, average length of stay decreased from 5 to 4.5 days, and inpatient mortality fell from 2.3 deaths per 100 encounters to 1.1. Since 2010, the coauthors write, health care systems in seven U.S. states have adopted the ACU model. In Australia, 200 hospitals in New South Wales are switching to the ACU to improve quality of care throughout the statewide system. "Ultimately, patients will get out of the hospital sooner," says Shapiro of the ACU’s potential. "They will come back less often because we’ve incorporated them into the care planning. We will be able to intervene sooner when patients veer off course. And patients are going to be happier." Read about the Accountable Care Unit in Harvard Business Review (November 2013) at bit.ly/ACU-HBR.